This was a big run training block. In fact it was huge. Together, these four weeks represent 25 hours spent running and 184 miles covered. They brought my run fitness from nothing special in early March after a few disrupted weeks of very poor training (no excuses, but also no regrets about that – details were in Update #4). I put together a series of workouts with great focus, good nutrition, and rather careful attention to not overdo anything. A big help to motivation was that everything had a purpose. I was clear on why I had added everything to my plate regarding training and so when I was out there running I knew what kind of training stimulus I was hoping to apply to my body. Sometimes it was simple, “another 40 minutes of forefoot running in the ecco biom shoes”, which I’m confident has been contributing to greater efficiency and much stronger lower legs. Other times workouts were race specific, training my ability to run marathon pace at the point in my long run where my stored glycogen was on the edge of being depleted. This knowledge of why I was doing things helped get me out the door. And getting out the door and training is an absolute prerequisite to getting to the start line and being ready to race. The body has responded. In discussion with my coach after that inopportune gap in my training he encouraged me to not completely rule out the option of an aggressive return to training. If you listen to how you feel and are careful not to stretch yourself to the point of destruction, it’s possible not to start from square one. It wasn’t reckless advice, it was actually exactly the opposite. It was a reminder to be careful about both what I was asking myself to do and how I was responding to it on a daily basis, not just on a week-by-week time horizon. 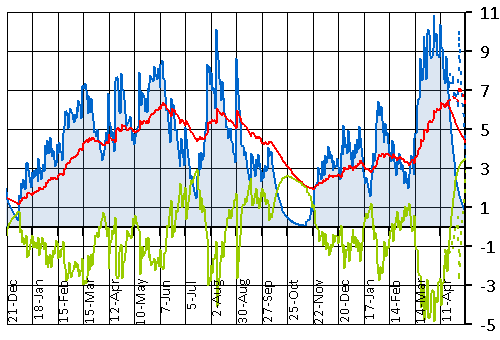 I jumped back into training, and my training stress balance (TSB) on the run went negative (green line at left). Last season when focused on progressing my running but also doing a lot of cycling and swimming I was able to handle with no problems a TSB of -2. I could handle without any extended recovery, dips to -3 during the early season, but later in the year found that I was limited by general fatigue from doing enough to reach those deep depths of TSB. So, I figured that -3 would be a good general target and that I’d see if I could handle dips to -4. I’ve mentioned before that I like to use different units than the conventional TSS, if you want to compare, one of my units is 1 hour of aerobic activity per week, at mid to high zone 2, which amounts to around 50 TSS, and one hour at threshold amounts to two units, or 100 TSS. That’s generally how things went, I maintained a stress balance with my running of a bit below -3 for a whole month and I’d stretch it past -4 with my key sessions of the week. There were a couple occasions where I just ignored the extra interval-section of my shorter runs, but I did strides frequently and never compromised on the plans around the long run sessions of the week. Overall, for this period of time, my weekly hours were nothing spectacularly high, in fact they trailed off a bit, as I chopped a bit of swimming out to make sure I could do the running. I was also running a bit faster as the weeks progressed during aerobic conditioning runs and so the total time it took to get the weekly mileage targets was reduced. As a whole, my net TSB was never more than -1 below my run TSB alone. 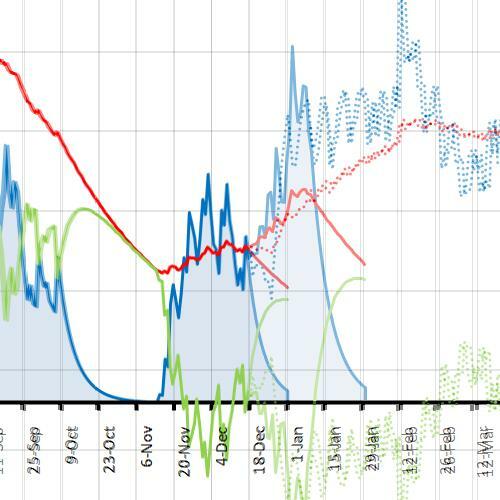 That’s the benefit of doing a lot of aerobic development on the skis over the course of the winter. I was capable of training the run harder by shifting focus without having to add a whole bunch of focus. That strategy was a good one. So, what are the markers of progression? First, I got my chronic training stress from running higher than it has ever been in my life. 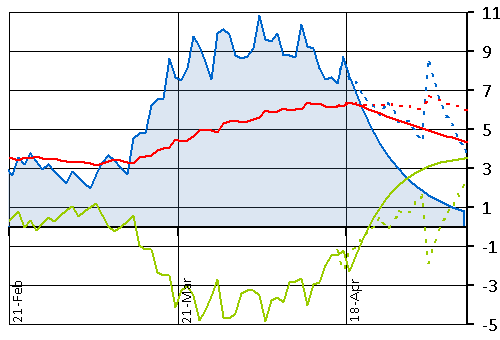 That’s the red line above, it’s not ahead of last June by much, only a half percentage, but it’s ahead none the less. That stat is a tough one to move, and it’s not a random fluctuation that I’m at last season’s run fitness. I’ll go back to the beginning of this post: 184 miles in four weeks – that’s why I’m back in ready-to-race fitness. 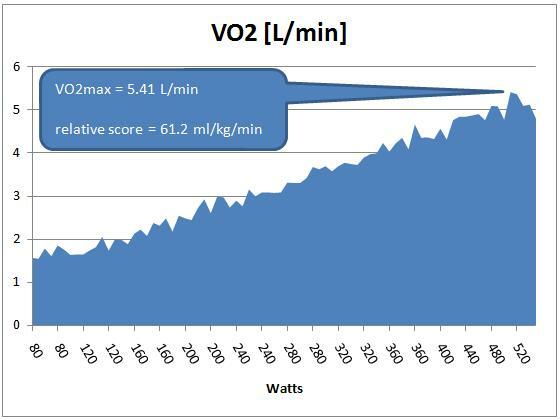 Secondly and more in depth: Back in mid-February I had my VO2max tested as a part of a research study and found I scored 61.2 L/kg/min. That was alright, I thought it was pretty good for early season actually. That same week I tested my MAF fitness with a 5km TT at 160 bpm which I botched up a bit and ran it with an average HR of 164. In any case, the tested pace of 4:28/km resulted in an estimate of my VO2score of 61.29 on the run. 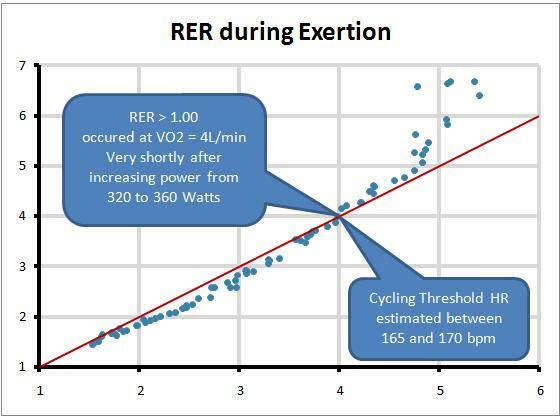 (The formulae for calculating these scores is from Alan Couzens of Endurance corner and the details are here: http://rkp.me/VO2score) That nicely matched the recorded actual VO2max and so I’m working directly with an unmodified formulation of the measurements. This weekend at the St Albert 10 Miler, I averaged a HR of 167 and thus scored a VO2score of 66.3 which indicates I’ve made a fitness improvement of a bit more than 8% over the course of the past two months. That’s indicative of real progress! One of the things that I think is a bit hokey about trying to measure these things quantitatively is that if you train with a lot of specificity for your testing protocol, then your performance at the testing protocol is going to be skewed in favour of showing that you are better than you might be in reality. 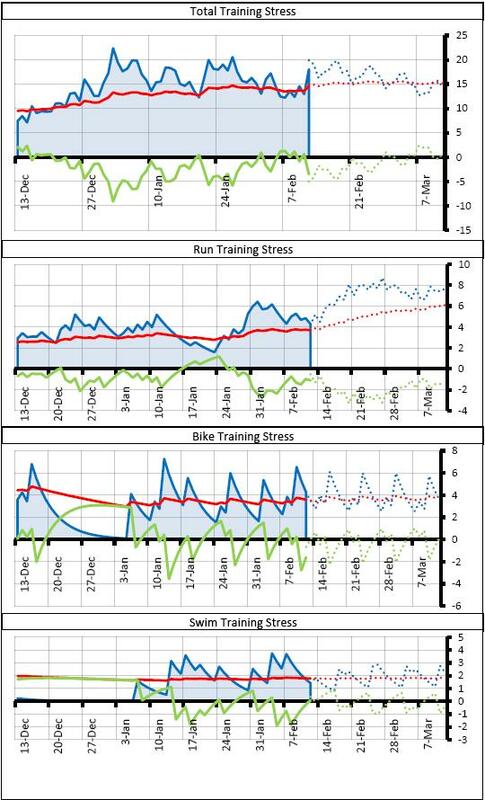 There are studies out there that show that your performance in power output over a 1 hour max effort is a good guide for what your performance could be over an ultra-distance triathlon. There’s also studies that show you can estimate your 1 hour max effort quite well by doing only a 20 minute max effort and then adjusting the result slightly. Well, if you start training specifically to perform well at the 20min TT, you might improve your result, but by doing so you are probably also reducing the effectiveness of the estimation that it is for your performance at the much longer race. If you can improve 11% at your 20min speed, 8% of that could be attributed to fitness, and 3% could be attributed to the skill of performing the 20 min test. Only the 8% is going to translate to other measures of athletic capability, your skill for 20min TTing is good if your race is a 20min test. I made the long explanation as a round-about way of saying. I was doing everything in training that I know how to do that will get me specificity at the marathon test (which is the race). Meaning that when on the weekend I measure that I think I’m in 8% better shape at the moment based on a few numbers, maybe I have also got 3% of marathon skills improvement that doesn’t show up in the fitness testing protocol because I wasn’t practicing to be tested at anything other than the marathon. We’ll see how this works out. I can’t say that I know what my marathon readiness was like in February because I couldn’t test it, and so I can’t tell you after the race in two weeks if I was 7% better or 10 % better, or even 25% better. I do think there’s something to that though. We watched Ryan Hall run a crazy fast marathon in Boston yesterday, but a few weeks ago he wasn’t ready to put together a fast half marathon. Why’s that? He’s got the fitness plus the skills for marathoning. He might have more skills than anyone on the planet, because he coached himself to do it. He attributed it to being strong, and in the post race interview I heard someone asking if he was going to get fast at some short distance stuff so he could be faster in the marathon. His response was a round-about way of saying “no”, maybe he’ll do some faster stuff because he’s interested in seeing how fast he can run 5000m on the track, but to be fast at the marathon he said he needed to be strong. That was encouraging. I wasn’t “fast enough” to be “fast” at the 10 miler this past weekend, that was my limiter on the flats and on the descents. But I was definitely strong enough to keep going, I have power in my legs even when they’re tired. I think that means I’m even more ready for a marathon than I am for 10 miles, that’s my 3%. In two weeks we will see! I’ll post another full update in a few weeks when the big push for marathon fitness is over. I’ve got some solid work to do this week including a 10km race simulation on Saturday that I hope to run right around 40-41 minutes, and that is backed up with a no-pressure-on-pace long run on Sunday. It’ll be my one kick at a long aerobic run with sore muscles during the buildup. I’ve done a lot of running like that in past, but have really made an effort in scheduling to not require that I do it very often this time around, this is the one situation where I am going to tackle it. It will probably be a relatively easy long run considering I am a lot stronger at this point in the season than I have been previously, I still want to do it though as it will have some training effect in adding some robustness to muscle durability. The alternative – trying to run a blazing 10kms the day after a long easy run doesn’t really achieve either of the training effects. 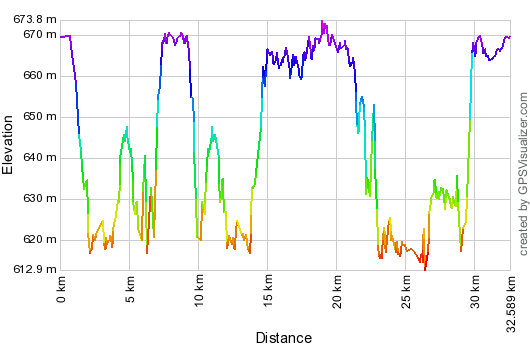 The easy long run is going to be pretty superfluous as far as race specificity goes because I’d probably feel fresh the whole way, and the 10km race simulation will probably have me feeling a bit flat and not likely to boost capacity for dealing with lactate. The weekend after that is my toughest long run of the buildup, 20 miles with 10 of them at marathon effort, I’m hoping I can bring them in below 4:30 pace again, and if so I will declare myself to have a realistic hope of qualifying for Boston. Oddly enough, it looks just about the same! ~85kms in 7.5 hours accounting for about 55% of my weekly activity. If you look closely you’ll see that my fastest run pace this past week was barely faster than my fastest run pace that week, my average run pace is actually a bit slower than it was that week, and my slowest run pace was actually slower last week than it was in 2009. What these stats don’t show is that… my fastest run pace during that week in 2011 occurred during the 12.5km marathon effort interval during the second half of my long run. Also, that my slowest pace occurred on a recovery run instead of on my long run where I was hurting, and that the average pace for my long run in the 2011 week was actually considerably faster than my average pace for the week. It also doesn’t show that I backed up this week with a Monday night workout over 2.5 hours in duration of running to the pool, swimming for an hour twenty, and then running a round-about-way home with zero calorie consumption across the whole thing. 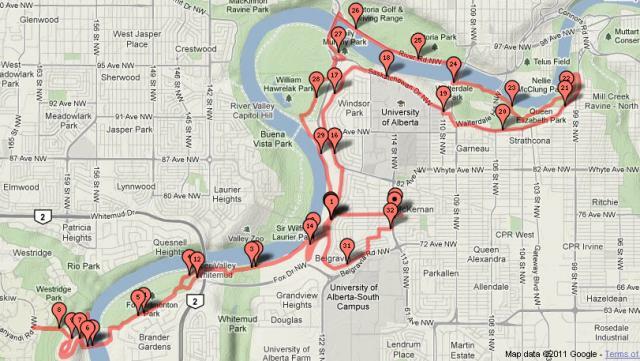 In 2009 I backed up that week with three days off and a weekly mileage of 16 kms. The fitness is in how things are put together, not purely in the generic stats, but I have faith that it’s there. It’s getting close to the season when lots of people are starting to throw down a weekly workout on the track instead of navigating the snowbanks and icy-sidewalks focused on aerobic conditioning. The easiest way to do the math is usually to run in the inside lane, but I really don’t like running the sharpest corners unless I have to. Instead I’d rather do the workout on one of the more outside lanes on the track… If possible it’s usually nice to run intervals on an increment of 10 seconds because it’s then pretty straightforward to keep track of the incremental time. The same idea as using a pace-clock in the pool, you graduate from swimming your 100’s on 1:35 straight to swimming your 100’s on 1:30 without going through a phase in between, keeping track is not worth the mental effort. If you can choose the lane so that the extra distance brings you across the line at the right time you can really save yourself a headache. Unfortunately, that math is generally too hard to do accurately enough on the fly in my head. It generally requires some relatively difficult pace to calculate and some weird distance. 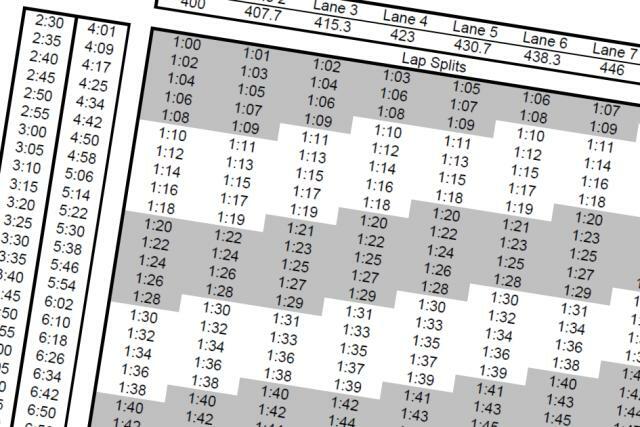 I cobbled together a set of lap splits for track workouts that will tell you the splits required to run certain paces in different lanes on the track. 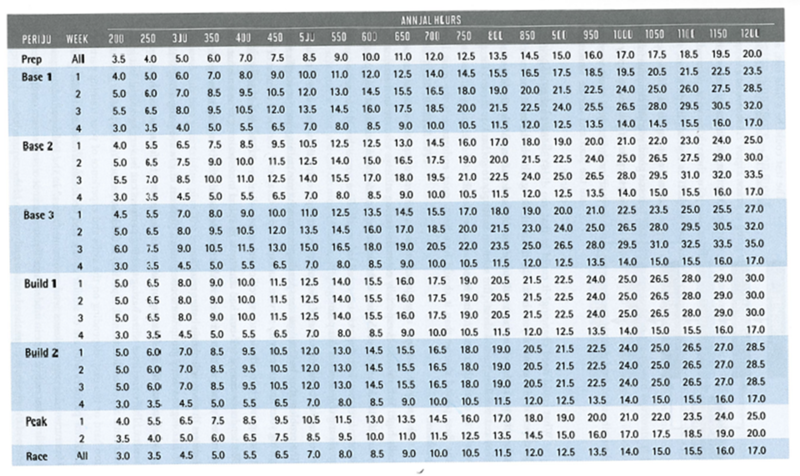 The general method for using this would be to look up the pace you hope to run in the left columns (both per kilometer and per mile are listed) and then run your finger across that row to find a lap split that is the closest to an increment of 10 seconds, choose that lane and get running. Doing this can increase your interval distance by up to 13% on an 8 lane 400m track or up to 19% on an 6 lane 200m track. So, if you’re dead-set on doing a certain distance interval, then use the inside lane. But let’s remember that those intervals are chosen to try and get a certain physiological response from the average person. I can personally guarantee that the physiological response of the average person varies by a lot more than 13%, and physiology probably varies more by time and speed than by distance. At least in my opinion, the benefit of running the wider corners of lanes 6-8 outweighs the insignificant benefit of running the inside lane to make an interval of a very specific length. It will probably also help you shy away from setting a new 800m personal record each time you show up to the track. You’ll pick the lane that corresponds to the pace you want to run, and then you’ll run the pace you wanted to run. This neatly evades the racing that can otherwise happen, between other athletes at the track, and with your former self, that can often happen when you get into your racing flats and start running in circles. I’ve got these tables in my smartphone so they’re always accessible and I think I will print one out on cardstock and laminate it in to keep in my gym locker which has a 200m indoor track. Do what you want with them, hopefully it’ll improve your training – Enjoy! 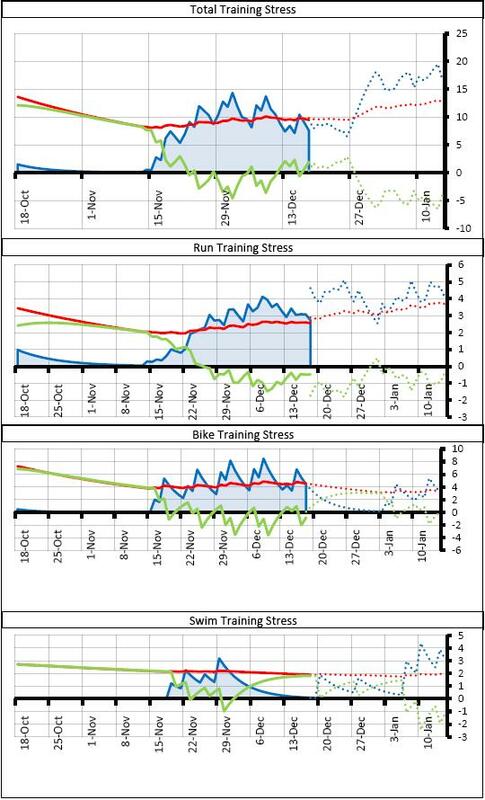 I did at best an acceptable job with sticking on a training plan during the past period of time. I’m not exactly proud to be posting these stats as it makes it evident that I haven’t been out running nearly as much as I said I was going to be running. I’ve had a few periods of good success, and one week of perfect execution on the run which occurred at the expense of one swim and a day of skiing. It was followed up by a good week of running which then crumbled on the weekend with a total of zero hours logged and coming up significantly short on my mileage target. The causes have been largely due to commitments surrounding the completion of my degree, with a few long weeks of work and relatively high levels of stress that were making it necessary to dedicate 10 hours of sleep per night to be able to function during the day. The result of that is time rapidly disappearing from training. I’ll also take a bit of personal responsibility for not treating these issues with significant enough urgency to solve the problems before they arose. Militantly defending little bits of training time throughout the week has a pretty poor return on investment and so when push came to shove I dismissed the necessity of training in adverse conditions as well as unfortunately trying to save time by making relatively poor dietary choices. There have been periods of great success sprinkled amongst these frustrations. I marked an improvement of another 15 seconds per kilometer on my MAF run pace later in January (to the 4:40-4:45/km range). Since putting in the period of 11 days of fantastic consistency I saw an improvement of my default pace from around 5:20/km to about 5:00/km which is nice. I was seeing a default pace (~140bpm HR) of about this speed during my 40 runs in 40 days challenge in May last year. At that point my MAF pace was around 4:15/km. I don’t believe that I’m going to test at that pace this coming week with a MAF run test so that means an interesting thing. I’ve somehow narrowed the gap between my MAF pace and my default run pace. The only thing I think I can attribute this to is my transition into a slightly different style of stride with much more of a midfoot strike. This may not contribute to me going a lot faster when running at a MAF limit but interestingly it is making me faster a very submaximal paces. I think this is good because it likely contributes to improved efficiency at those faster paces at a more rapid rate than if I have a large discrepancy between the two sets of paces. Maybe this isn’t happening, I haven’t tested my MAF pace in three weeks, it could be that I’m already at the aerobic fitness required for the 4:15/km pace which would be nice because that would be goal marathon pace already, nearly 70 days prior to the start! The PMCs at the left show that I have been able to keep building fitness over the past period of time (ATL is ahead of CTL all the way) and so despite really mentally feeling like I wasn’t giving my attention to training the same way that I wanted to I was still progressing. This is a comforting sign and it’s a reminder to me that I need to keep taking stock of where I’m at numerically and in testing rather than just how I feel. It’s fine that I’m not able to be throwing down a bunch of 18-20 hour weeks the same way I did last February, because my fitness is in a different spot and I’m progressing it from there. That said, my training stress balance is not as negative as I know I can handle at this period of the season and so I could be training a bit harder. That’s also OK for this period of time. The snapshot shows that I keep pressing onward with my general fitness for the next period of time until the second week of March which is a bit of a breather (my training stress balance should “come up for air” at that point) before getting into a period of 3 week “Lactate Threshold Phase” and then moving in to what the Pfitzinger plan calls the “Specific Prep Phase” which continues on with the Lactate Threshold work but is directed to helping me dial in the marathon pace. That leaves me with a two week taper into the race. This is on the shorter side as far as tapers could go but I believe that because I am not trying to dig a huge hole it shouldn’t take so long to climb out. I’m training with the focus of getting fast during the final period of time, not trying to get outrageously fit by loading up on volume so a gigantic taper should be unnecessary. 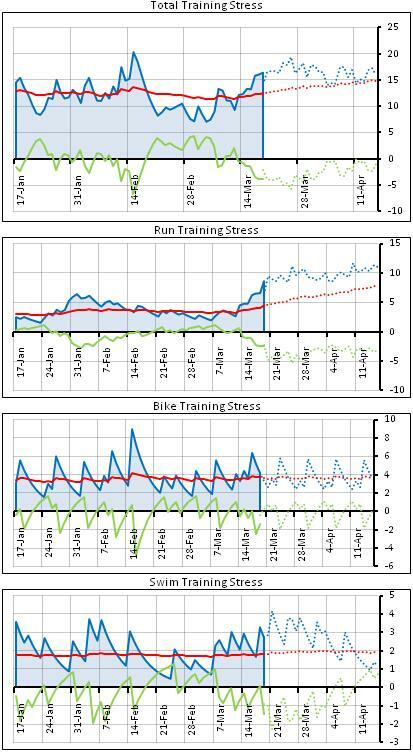 At right is an indication of my planned run fitness which shows a progression in training stress from -1 unit to -3 units. I know that this is reasonable to expect of myself, but it’s important to note that I plan to maintain a training stress balance of overall fitness hovering right around zero the entire time while I do this. This is done by paring back my commitments to other sports (skiing is no longer scheduled at all past mid-March for example). I began writing this post on Monday but didn’t have the focus to keep writing so I put it on hold. Then I got distracted by the very interesting statistics from the VO2 test on Tuesday and writing up a blog post on that. At which point I needed to buckle down and focus for a successful thesis defense on Thursday. That little delay enables me to conclude this post by answering my question posed a few paragraphs higher up about what my MAF pace is at the moment. I tested today indoors (because it was -22oC outside) and stupidly calculated which lane I needed to run in on the track doing 1 minute laps to get me running at 4:15 pace (Lane 6 on a 200m track in case you were wondering). So, needless to say this caused a bit of strife because I set out to test my HR at 4:15 pace instead of following the normal MAF testing protocol which is for me to run at 161 bpm and then measure the resulting pace. After warming up I ran 1500m at that pace at which point I had received enough feedback from my HRM and my breathing rate that I was not in the kind of shape required for 4:15/km at MAFHR fitness. I wouldn’t call it a botched test, it was interesting to follow that kind of testing design and I think I learned a few things from it about pacing (I think this kind of testing protocol would actually be pretty useful on the bike riding in rolling terrain with a powermeter) but I was also able to then dial back the intensity on the run and still salvage a better estimate of MAF pace which scored me around 4:25-4:28 per km. That’s alright, it’s a good progression in the past few weeks so I’m satisfied. To wrap up I’ll post two tentative schedules. The first is for the next three weeks (well, this week is more than half over already) and is the final three weeks dedicated to aerobic development. I know already that I am going to come up way short this week on running mileage which is frustrating but I’m going to go skiing anyways for two days and enjoy it, I’ll be just fine for hours as a result! 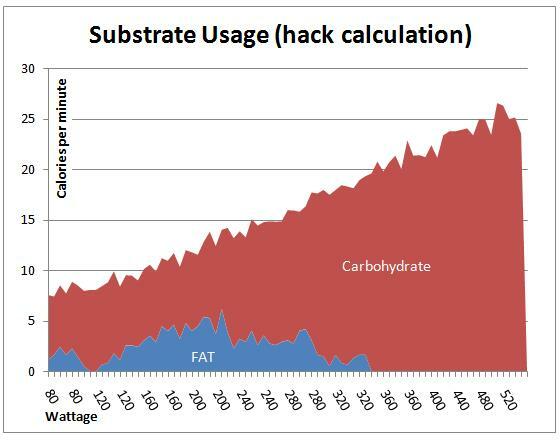 I am also posting a tentative look ahead to the following three weeks which the Pfitzinger “Advanced Marathoning” book describes as a Lactate Threshold phase. 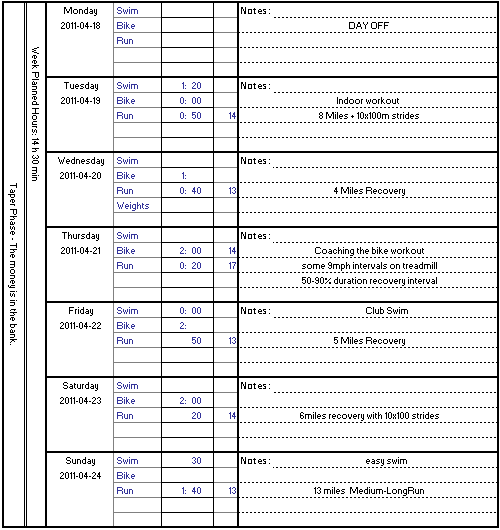 I currently have this set out according to the second “level” of mileage targets in the plan design and before I start into the next phase of training I’m going to assess whether or not I’ve been successful enough during the current aerobic phase to tackle that or if I need to scale back my expectations for myself (basically determined by if I can put together good consistency for the next two weeks). I’ll post again in three weeks on the subject of doing that mid-build self-assessment. If the pattern I’ve been monitoring with my MAF testing continues as it has been going I will have a MAF pace that is very closely correlated with goal marathon pace by the point in time that I begin Lactate Threshold focus. That would be ideal. The result would be that my race-pace work is going to be right on the edge of being aerobic so it should be manageable. It also means that all of my lactate threshold work will be above race pace instead of (say, if I switched into that phase of training at the moment) being at around race pace and so will be training my mind to think of marathon pace as the relatively manageable. That’s a big coup. I know that when I was running lots of my shorter aerobic runs at around 4:45-4:50 pace during June and July in 2010 and staying completely aerobic throughout their entire durations I was really developing a strong belief in my ability to take on the 5:00/km goal pace at Ironman. Training that perception in advance of the marathon in Vancouver is important to me as I know it will make a difference in how well I am able to stay focussed in the race-situation. I did a mediocre job of following my schedule in the few weeks leading up to the Christmas break. I did find bits and pieces of time to train but I was also doing stupid amounts of time in the lab turning the crank and churning out page after page of my MSc thesis. The thesis was considered relatively complete until my supervisor chucked it back at me with major revisions. It wasn’t a very nice realization, I’m not so much cut out for the world of academia, and I’m trying not to think about it too much. In fact I’m not going to write much about it either as that would require me thinking about it. In short, I hope accepting this new job starting March 1 isn’t a huge mistake. Then over Christmas break I just tried to run frequently, I wanted to hit 25 miles per week a couple times and I was successful for two out of the three, I would have been on track to hit it on the week between Christmas and New Years but I found myself in Fernie skiing my fool face off (and loving it!) and so I’ll take a mulligan. 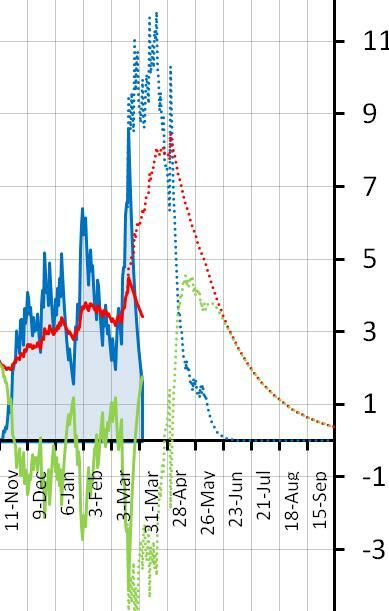 These next two charts show my progress up until Christmas and then my progress over the Christmas break. The PMCs above show that over the Christmas break when I went totally off program and gave up on trying to schedule anything for myself I still did get in lots of general aerobic work as I had wanted to during that period. 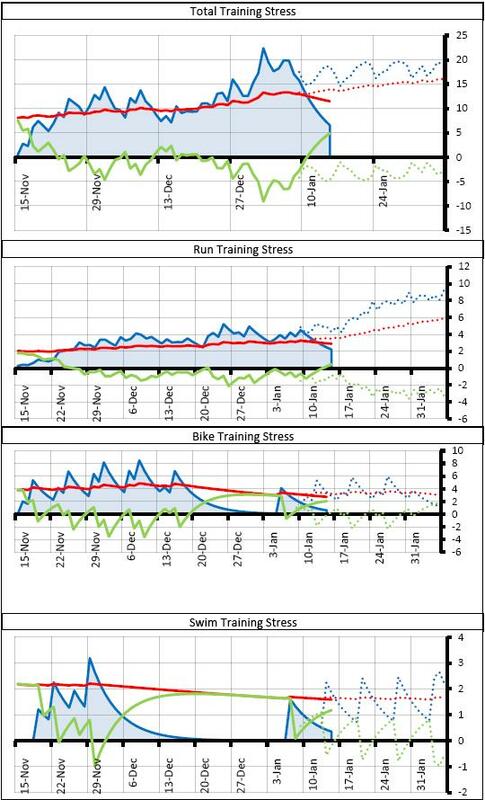 The little chart at the left here with the two overlays compares the planned training effect with the one that was actually completed over that break, it lines up just fine. I’m still on track in terms of developing basic fitness and despite not trying very hard at planning my instincts for how much, and how soon, were just about appropriate. I am due for a MAF Test on the run soon but with the forecast at or below -20o for this whole coming week I might have to wait a bit. There isn’t a whole lot of purpose in measuring MAF pace while running with tights, fleece pants, shell pants and a fleece jacket, the measurement isn’t going to be very accurate anyhow. I do have an estimate of MAFHR from some recent treadmill running that puts it around 7.6-7.7 miles per hour which is slightly sub 5 min/km or a bit better than 8 min miles. That’s alright progression if you ask me, about 25 seconds/km pace improvement over the course of a bit less than two months. Slow and steady wins the race. As I mentioned previously I think it would be good to get to 4min/km at MAFHR in time for the Vancouver Marathon (a bit less than four months) which necessitates me being keeping up this kind of progression in MAF pace. 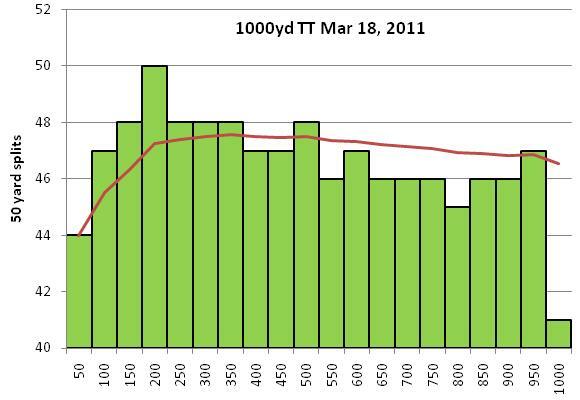 I don’t really have a great indication from previous tracking of these metrics of how fast I can hope to improve, my testing last year started at around 4:20 pace and progressed to around 4:04 pace while I really developed a ton of durability to run at that effort while maintaining volume in the training program. Recently I’ve been able to do a lot of my running rather close to MAFHR and haven’t felt like I’m straining myself much to do it. That’s an alright sign, it indicates I’m in need of conditioning my cardiovascular system and that I’m not straining the muscular/joints as much as I did last year while developing my ability to run. I was out of the pool for a LONG time and my first time back was tough work but I enjoyed myself, I don’t anticipate that it’ll be easy to swim a ton this winter but I am hopeful that I can do a decent job of it. The planned training is a bit dubious, I don’t know how everything will work out with the weather looking so outrageously poor. I also don’t really know how the skiing works out as I typically will want to go with other people and just don’t have the interest to go and do three hours of skiing by myself in the woods. We’ll see how things stack up. I’ll have to be flexible here. The key workouts of the week are the runs. I want to put in a good solid effort at getting the frequency up to 5 times per week here or close to that for the next stretch. It’s mostly a matter of getting dressed up and out the door. That’s all it took yesterday and once I was trundling along I quite enjoyed myself, but when getting dressed takes forever because I have to dig up a dozen pieces of clothing instead of just shorts, socks and a shirt, it’s no wonder that it takes a bit more coercion than usual to get going. Fingers crossed that a cold January makes for an early spring so I can get in the uninterrupted running when it will be the most frustrating to do it inside. I also wouldn’t mind the opportunity to sneak in a couple weekends of skiing in March if possible. 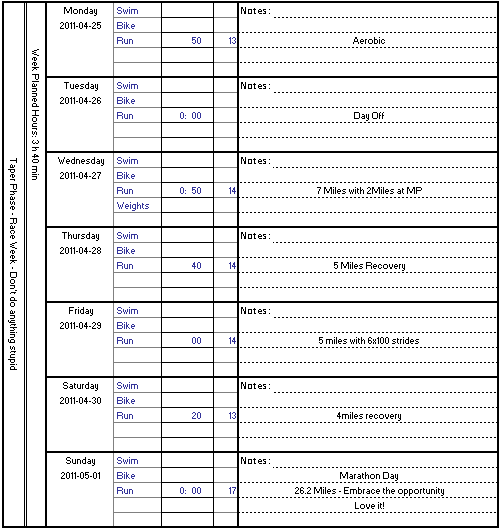 Anyhow, here’s the training plan through until the Birkebeiner. Things might require some serious adjusting, but the running framework looks like it’s flexible enough to stick.